I love being able to model my thinking for students and to be able to share student's work. This is powerful for visual learners and for student's to take pride in their work when sharing with others. My ELMO camera has stopped working, so I have struggled with being able to demonstrate my thinking and share student work in a way that can be easily seen by the whole class. My district has been looking at using iPads and document stands to replace the ELMOS. 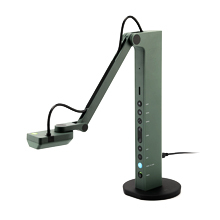 I heard about IPEVO through one of my graduate school classes and would love to have the opportunity to see how these document cameras work. It would be great to find a product that is way more cost effective for classrooms and still works well. We don't have an abundance of desk space, so the size of the IEPVO looks like it would work very well! Thank you for your consideration!